It was a mistake…Tiffany ordered Nutural Cures “They” Don’t Want You to Know about by Kevin Trudeau. The company sent The Weight Loss Cure “They” Don’t Want You to Know About. It took Tiffany a while to figure out that she had received the wrong book because it had the correct paper cover on the outside of the wrong book. Tiffany knew I was always trying to lose weight, so she passed it on to me. I read the book and was excited that the book described my life/metabolism and a ‘cure’ that was very different than any I had ever encountered. It gave hope of losing weight AND keeping it off by being able to actually affect metabolism and fat loss in places I thought were impossible, such as the knee pads. What made you decide to write your HCG books? At the time, there were no other books in plain English to help people know exactly how to do the diet including how and where to get HCG, all the little tricks and hang-ups are not obvious, but can cause slow or stall weight loss. As time went on, the amount of information increased dramatically, but so much of the information was untested and quite inaccurate as most people were basing the information on interpretations of what others wrote or solely on personal experience, which is not enough experience to come to accurate conclusions. We were lucky to have businesses that allowed us to track thousands of participants from start to finish – this is where we learned the bulk of the intricacies that offered further proof of what Dr. Simeons described. What was your favorite part of the writing process for your HCG Book? I don’t really like the writing process, so my favorite part of the entire process was ordering the proofs. This always meant the bulk of the work and rework and rework was done, and I would soon be holding a book in my hands. 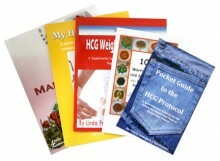 What do you think people will get from reading/using your HCG book? Consistent results. People get honest, tested, proven information with accurate warnings about what does work and what doesn’t work. We only talk about what we know to be accurate after working with thousands of clients. We never recommend anything that is untested, regardless of who owns it or what profit margin it may have. Every product discussed has been tested and accurate descriptions of what to expect or clearly given. Spend time and/or money to ensure that you are buying effective HCG and receiving accurate information. Barring a few medical conditions and/or side effects of certain drugs, effective HCG and good information leads to success with participants who follow the program. Prepare yourself physically by getting the right tools together, psychologically by assuring yourself that you can do anything for 30 or 40 days at a time, and socially by either getting someone to do it with you or staying away from people who will sabotage you. You CAN do it…the question is will you?